Electronic chess boards are an innovative way of learning how to play chess. These are boards that can be connected to your PC or laptop so that you have access to advanced playing capabilities. They are also suitable for tournaments, and you get to interact with other electric chess enthusiasts on the internet. You can record your games and keep track of your progress. Even as an advanced chess player, there are advanced levels that offer you the challenge you need to improve your technique. You can choose to learn with computer moves or play with another opponent. With this electronic chess board, you get free USA shipping and discounted global shipping services. You can order your chess board online and have it delivered to your door. The friendly and available customer support team will answer any questions you might have. The highly-rated site offers chess board games used by club and tournament players. The high-quality chess boards guarantee 100% customer satisfaction. The Chess Genius Pro features a world-champion software that offers you the challenge you need to improve your playing technique. All skill levels are accommodated from beginner to advanced players. This electronic chess board was launched in 2015, and Richard Lang’s software was used to ensure you significantly improve your playing skills. There have been many improvements that have been made on the electronic chessboard to ensure optimized player experience. For one, it is a more elegant chessboard featuring white and black chrome. The new computer was improved based on suggestions and insights given by avid players. All ideas contributed by players have been incorporated to ensure it is a customized Electronic Chess Board. As an ambitious chess player, you will find that this chess board offers you the challenge you need to improve your skills. The improved playing algorithms force you out of your comfort zone so that you adopt new and enhanced playing styles. Ensure you purchase an AC power supply cable that is most suited for this chess board. This board features an increased processor performance as well as excellent battery operation. The chess trainer takes novice players through the game so that they learn from experts. You get warned against wrong moves so that over time you get the drift of the game. Suggestions are also made for correct moves and how to avoid checkmates. The multilingual user interface ensures that the game is not restricted to English speaking individuals alone. The back-lit display illuminates the whole chessboard so that you have an easy time making moves. 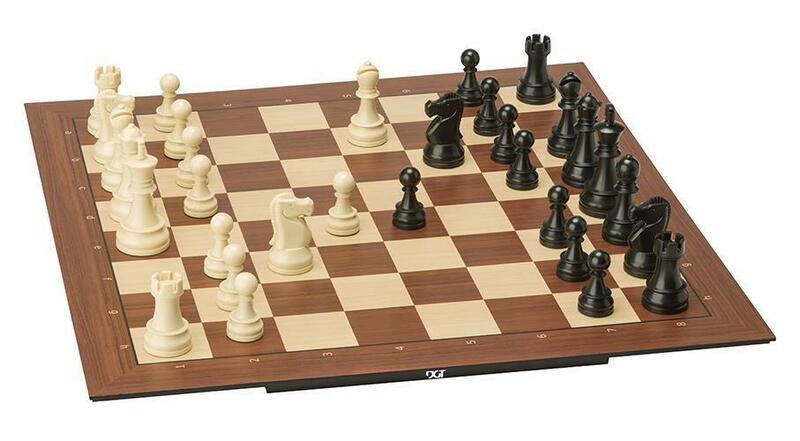 This is a luxurious yet affordable chessboard that offers hands-on gameplay. 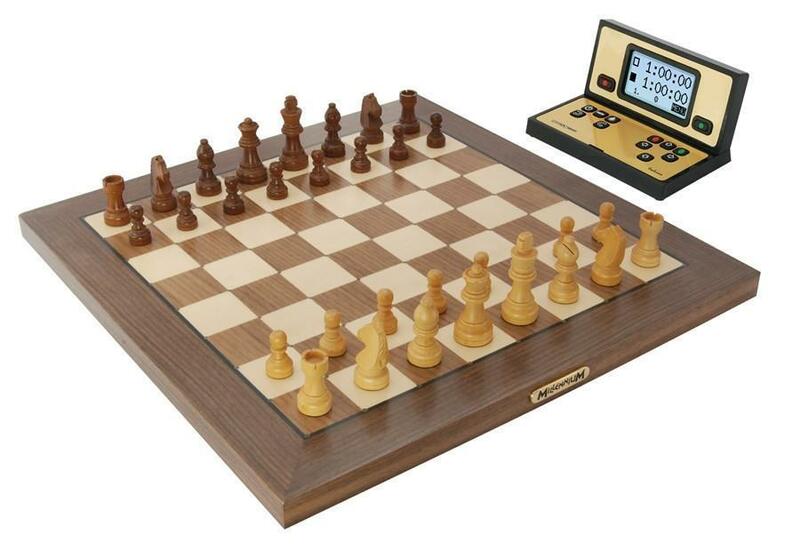 It is an electronic chess set that is excellent for solo chess play. This chessboard was engineered in German and all contributions made by avid chess players where incorporated. This is the ultimate hands-on chessboard as it allows you to play from home with insights from a chess software. The architect of this electronic chess set ensures it is as real as the traditional chessboard. It features the most comfortable chess board size, and you get the best from both worlds. The beautiful design is because this is a handmade wooden sensor board. The attractive display and the elegance of the featured colors make it a suitable purchase. The design is easy on the eye, ensuring your eye stays on the chessboard. This chessboard features LED lights that illuminate your every move. When you are playing alone, the computer beckons you by making its own moves. This ideal chess computer has an automated piece detection that makes playing swift and fun. The rapid sensory technology and the generously sized display ensure beginners have an easy time mastering moves. You can also make future software updates thanks to the cable connection between the board and the clock. ARM Cortex M7 processor powers this chessboard. The increased RAM and flash memory allows you to have ample space for storing your recorded games. 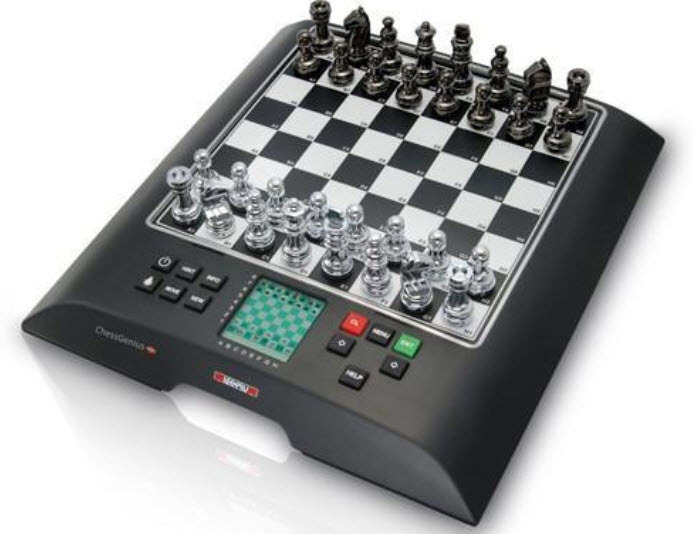 These Electronic Chess Boards feature hardware modules that can be entirely replaced. The chess trainer included comes in seven languages, and the CPU speed is 50-300MHz. The software is based on a world-champion program. • Flexible display options that include a multi-line info display, an entire chess field and chess clock. • Power supply connections include adapters and international sockets. • This chessboard features a playing strength greater than 2300 ELO. This chessboard wirelessly connects to your PC or laptop thanks to the incorporated Bluetooth technology. This is an e-board plug and play that is available in rosewood. This is an aesthetically appealing chessboard with five available electronic DGT chess pieces. You get the best of two worlds with this chessboard since you also get to play against online opponents. The advanced tech used in the designing of these chessboards allows you to maximize your experience. This elegant chess board ensure you enjoy PC chess play. You can broadcast chess games over the internet and showcase your technique and skills. The chess computer allows you to automatically store chess games in the memory board for future reference. As an avid chess player, this digitalized chessboard ensures you have a fun time playing challenging games. There are five different Staunton wooden chess pieces available, and you can connect to a DGT clock. The presentation is ideal for playing tournament games as well as solo play. Accurate and fast chess moves allow you to have a seamless and swift gaming experience. This is a classic electronic chess interface board that can accommodate a wider audience. Its innovative design and lightweight nature make it easy to move around. 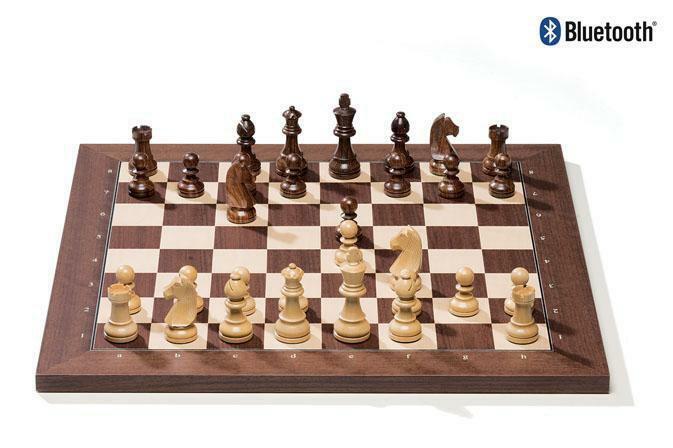 The wood print finish gives this electric chess board a modern look. It is thinner than traditional wooden boards, and it’s compatible with current DGT pieces. You can also choose to go with the plastic chessboard that is surprisingly durable and long-lasting. This is an affordable electronic chess board that allows you to interface with Windows OS or DGT Pi. It is a smartboard that can be used at events, at home or outdoors to enjoy a fun chess game. This electronic chessboard comes with DVD drives that allow you to record chess games for future references. You can choose to play with a chess computer opponent or a one on one opponent. It features the best playing software programs that offer advanced players the challenge they need to improve their playing skills. The tournament setup is fully compatible with the wooden DGT e-boards. It is possible to have live internet broadcasting as well as free cloud service. With this electronic chessboard purchase, you get 100 days of playchess.com. • You get to automatically store games played. They have many benefits thanks to the incorporation of modern technology. First off, novice players get an opportunity to interact with a trainer who’ll take them through the whole game. You even get warned when you are about to make wrong moves. Electronic chess boards also allow you to interact with fellow game enthusiasts over the internet. You get to learn new playing skills without having one on one interactions with online opponents. 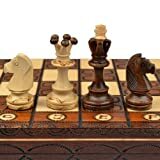 These chess boards give you the best of two worlds as you get an aesthetically appealing chessboard that you can connect to your PPC or laptop. Different chess set brands prioritize certain features when manufacturing their products. Based on what your preferences are, you get to choose a brand that caters for your needs. Consider purchasing from well-reputed brands, so you enjoy their one-year product warranty as well as 100% customer satisfaction guarantee. Some of the popular chess brands to purchase from include Chess House as well as House of Staunton. Many factors determine the pricing of an electric chess set. One of them being the quality of the product. Even though you should compare prices so that you settle for the best deal, ensure you don’t compromise the quality of your chess set. Purchase a product with a long lifespan so that it serves you for an extended period. Once you establish the credibility of an online chess store, the next thing is to use chess set selection tips to purchase the product that best suits your needs. There are many online chess stores that offer electronic chess sets. Consider reading reviews to determine their customer satisfaction rate. A customer-centered chess store will be dedicated to helping you choose the best chess set. To begin with, you need a high-quality chess set whose software is compatible with your computer’s operating system, this way you don’t have to worry about finding a PC or computer that is compatible. Also, consider going for an electronic chess set that offers wireless Bluetooth connectivity. This way, you won’t be limited by the length of cables. The memory of the chess set also matters because this way you can save your games and keep track of your progress. Electronic chess boards are modernized chess boards that allow you to play with internet chess opponents. Ensure you choose a well reputed online chess tore when purchasing your chess board. There are many factors to consider when purchasing a chess board. As an avid chess player, electronic chess boards offer you an opportunity to enjoy a fun yet challenging game.